I'm on Facebook--Now What??? helps you understand how you can get the most out of your Facebook account. Facebook took the internet by storm and brought social media to the masses. There are now over 1 billion people using the site monthly, from all around the world. And Facebook, along with other popular social media properties, has revolutionized marketing. Where marketing was once dominated by one way messages to the masses, it is now much more relationship based. And while marketing used to require big budgets and favor large businesses, it can now be done much less expensively, leveling the playing field for organizations of all sizes and geographic regions. In this updated version of the book we will bring you up to speed on the changes to Facebook since the last version of this book was published, as well as teach you how to get started with a Facebook business Page, how to create engaging content that meets overall objectives, how to manage your Facebook Page and build community, how to create successful Facebook ad buys and promotions, how to measure success, and how to use Facebook applications and plugins. 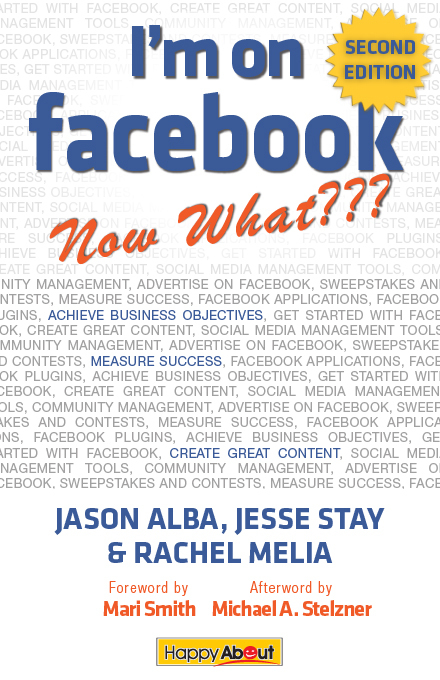 The book is written in easy to understand language and includes many examples of how successful businesses and organizations are using Facebook, as well as Action Items to help you utilize what you learn. Contains a foreword by Mari Smith and an afterword by Mike Stelzner. 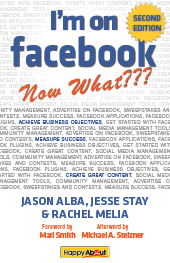 Want a branded edition of I'm on Facebook--Now What??? Jason Alba is the CEO and creator of JibberJobber.com, a web-based system to organize and manage a job search (and the networking you do between job searches). Jason is a certified Personal Branding Strategist and popular blogger and speaker about career management and social tools for professionals. Jason wrote I’m on LinkedIn – Now What?? ?, one of the first books on using LinkedIn. He also wrote I’m on Facebook – Now What??? and is finishing two more books (Eight Lunches, for entrepreneurs and a book on social media etiquette). Jason maintains several blogs including JibberJobber.com/blog, and contributes to the AOL Jobs blog. In his spare time he created the LinkedIn for Job Seekers DVD. Jason has an IT and business background and earned a Computer Information Systems degree and an MBA. Jesse Stay is a speaker, author, blogger, and entrepreneur, who writes and consults on the topics of social media and new media architecture, bridging the gap between “technical” and “social” for both marketers and developers. Jesse has written four books—his latest two,Facebook Application Development For Dummies, and the recently released Google+ For Dummies the breadth of knowledge Jesse has to offer. Jesse was also named one of 20 developers to follow on Twitter and one of 10 entrepreneurs to follow on Twitter by the top Tech blog Mashable.com. Jesse also hosts his own successful blog, Stay N Alive, perhaps the #1 tech blog in Utah and is regularly featured on Techmeme.com. Aside from that, Jesse’s articles have been featured on sites such as LouisGray.com, the top two Facebook blogs, InsideFacebook and AllFacebook, as well as Venturebeat. You can also see the coverage and breadth of Jesse’s influence on Delicious. You can find him on his blog, on Google+, on Facebook, or on LinkedIn. Book him for your next speaking engagement! Rachel Melia is an Online Marketing Consultant specializing in Facebook marketing. Rachel enjoys helping clients build vibrant social media communities that achieve their business objectives. Rachel’s background includes many years at San Francisco advertising agencies on well-known clients including Kodak Gallery, Microsoft, Palm, Siebel, and Tivo. Rachel became a consultant seven years ago and has worked with start-ups and small and medium-sized businesses as well as non-profits and government organizations across categories including health, travel, parenting, personal finance, food and beverage, technology, and mobile. Along with working closely with ongoing clients, Rachel regularly speaks about social media and Facebook marketing. Rachel is based in Silicon Valley where she was born and raised. She has a Bachelors in Communication from Santa Clara University.